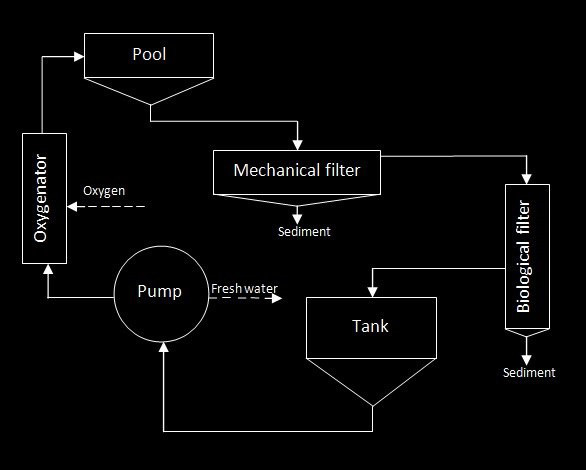 Recirculation aquaculture system (RAS) is the pools with the connected system of filtration and water circulation for the oxygen. The use of RAS for sturgeon growing is justified in the regions with the unnatural climate conditions for the fish, so the fish growth stops being depended on the weather conditions. By means of RAS the water temperature and the level of its saturation with oxygen can be regulated which allows, for example, to get several spawnings a year. The density of the fish content comes up to the 70 kg/m2 because of the recirculation aquaculture system. The sturgeon which was bred in the closed-circuit water supply installation, attains its commodity weight by 1-1,5 years. The sturgeon is considered as the capricious fish, that is why all the normal life conditions must be created in the pool. • Providing fish with the dissolved oxygen. • Provision of constant water circulation through the biofilter without stagnant anoxic sections. • Smooth flow of the young fish and even removing of the adult fish. • Regular removal of sediment and other waste from the pools. In this connection the pool must be visible until the bottom. The density of fish in the pool can come up to 60 kg/m2, and the productivity can exceed 70 kg/m2. Sturgeon grows up to 1 kilogram within the 1 year only. From the company’s web-page: “Our company works on creation of commercial automated fish farms made with the recirculation aquaculture system (RAS) technologies for fish breeding. It gives our clients the opportunity to grow a lot of fish with the minimum costs. Since our RASs are compact and consume little water and electricity, they can be allocated within the city line, and then sell the fish at the consumer prices and not the wholesale prices like the fish factories do”. «AKVA AGRO» company will install to the fish farm the unique own-developed product for the automation of fish breeding in RAS. From the author’s web-page: «This project is unique because all the program code has been written by our fish-breeders, and not the temporarily-employed programmers who know nothing about the fish». 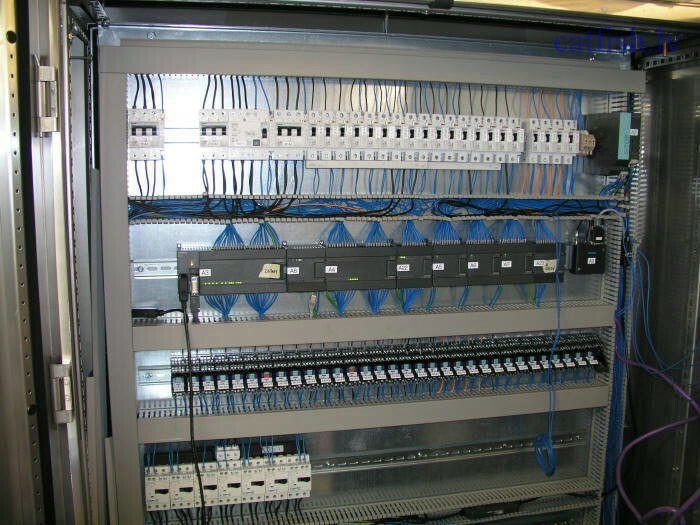 A choice of automated fish farm. For example, Riga, Tallinn, the Moscow Area, Minsk, etc. A brief summary of a chosen fish farm and a link to our main website where there is a complete description with pictures and construction stages of this automated RAS. Monitoring of all water parameters (oxygen concentration in water in all pools, water pH-level, electroconductivity of water, temperature, redox potential of water, total ammonium concentration in water, nitrites and nitrates concentration in water) makes a graph every 15 minutes. Database of water parameters is archived every 15 minutes. The work of the automated fish farm RAS is shown in a table. All components of RAS are shown, their mode (automated, i.e. managed by a controller or manual mode) and if they switched on or off at the moment. The basic water parameters are shown as well. It is possible to see what was happening in any day and time in the past. Database of components is archived every 15 minutes if changes. Feeding parameters on each pool of the fish farm. Fish biomass, feeding coefficient, feeding start-time and end-time, daily rate of feeding, speed of feed dosing, time of the next feeding, forecast of the fish biomass and feed for 30 days and a lot of other useful and important information is shown on the screen. Fish feeding graph on each pool is shown in columns. The number of columns means fish feeding times during the day, and the height of columns is dosage in grams. It is interesting to watch how computer automatically increases the amount of fish feed taking into consideration their growth. The graph shows the number of fish in every pool. Fish farm events graphs on each pool: death-rate, medical treatment of fish, transfer of fish from one pool to another, catch of fish. Analytical graphs: the graph combines fish feeding indices with water pH-level and oxygen concentration. Our Internet site automatically sends out e-mails or SMSs to the authorized users in «Fish-breeders» group if water parameters get to the critical level or the connection with the fish farm is lost». 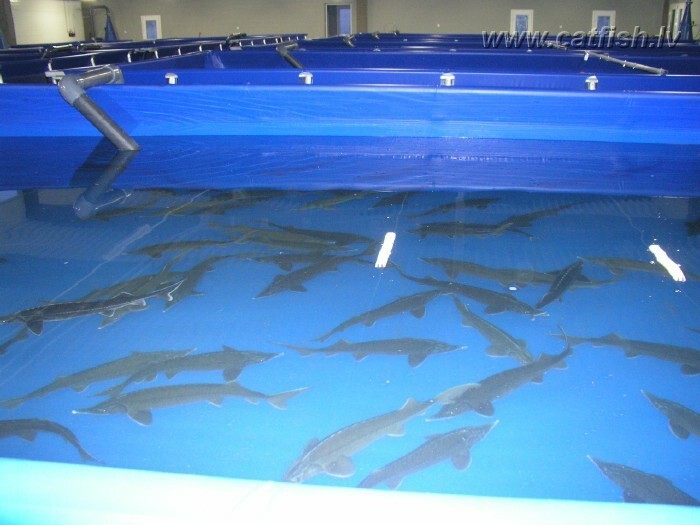 Currently, the sturgeon breeding farms operate in the United States, Canada, Israel, Uruguay and Vietnam, but not all of them a caviar-oriented. The biggest wholesale customers are China and Japan. Today the wholesale prices in Western Europe are 700-750 Euro for a kilogram of intravital-extracted caviar. Analyzing the state of the sturgeon breeding commodity in Central and Eastern Europe, it is observed that the interest to breed the sturgeon appeared in countries that used to belong to the Soviet Union in different years: Ukraine — 1977, Moldova — 1980, Russia — 1988, Belarus — 1990. 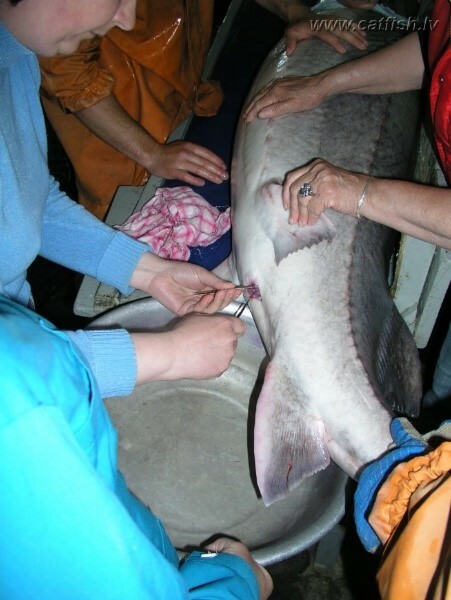 This is due to the fact that in the Soviet Union there were all the preconditions for the sturgeon commodity development: Soviet scientists have developed the fundamentals of bioengineering for breeding these valuable fish species; there were trainings and retrainings of specialists; there was enough of fish stocking material. From the mid 90’s of last century when the sturgeon natural resources began to decrease heavily, the commodity sturgeon breeding started to develop in many countries around the world, including Central Europe: Bulgaria, Romania, Poland, Hungary, Czech Republic and others. In commodity sturgeon breeding there are those kinds of sturgeon species which showed quite good piscicultural qualities (growth rates, survivability): Russian and Siberian sturgeon and their crossbreeds, beluga, sterlet and their crossbreed bester, and sturgeon-like veslonos. In order to get 1,5 tons of black caviar, it is necessary to keep at least 15 tons females, have a department for preparation of females replacement and winter/summer simulation system.